Belize is recognized throughout the world for its exceptional sport fishing opportunities for bonefish, permit and tarpon. Belize is, in fact, one of the few places in the world where anglers have a realistic chance for the “Grand Slam” of flats fishing - a bonefish, permit and tarpon all caught in a single day. For more than a decade, the sport fishing industry in Belize has recognized the need to protect these three valuable species, but numerous attempts to do so had been unsuccessful. Turneffe Atoll Trust felt that decision makers in Belize needed more information in order to make a fully informed decision, and in 2008, Turneffe Atoll Trust funded a study entitled, “The Economic Impact of Recreational Fishing for Bonefish, Permit and Tarpon in Belize for 2007” (Fedler, Hayes et al. 2008) demonstrating the substantial impact of these three species to Belize's economy. With the economic issues clarified, efforts to protect bonefish, permit and tarpon were reintroduced in 2010 with the landmark catch and release legislation, deeming that no one in Belizean water is allowed to possess these three species "except in the act of catch and release". 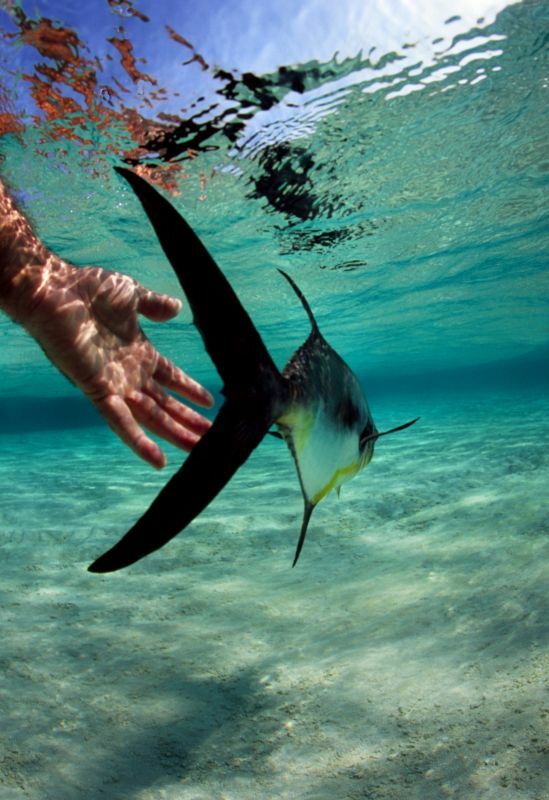 In addition to funding the above mentioned study, Turneffe Atoll Trust worked closely with key governmental agencies in Belize, non-governmental agencies and the sport fishing industry. The economic impact of these species in Belize, as shown in the “study”, was essential for solidifying the support of key government officials, particularly the Honorable Minister of Tourism, Manuel Heredia, and the Honorable Minister of Agriculture and Fisheries, Rene Montero, as well as the Department of Fisheries. Widespread support for the project was expressed through a country-wide petition drive with approximately 2000 signatures, and a very positive and well-attended National Consultation. Subsequently, Turneffe Atoll Trust assisted in the process of drafting the legislation. Belize Tourism and Industry Association, Belize Tourism Board, Belize Hotel Association, Ambergris Caye Chamber of Commerce, San Pedro Town Counsel, Orvis Travel, Yellow Dog Fly Fishing Adventures, Frontiers Specialized International Travel Consultants, Cabelas Outdoor Adventures, Patagonia, Roxton’s Worldwide, Bennett Mintz Public Relations, Bonefish & Tarpon Unlimited, Traveling Angler Worldwide Expedition, Charles Schaeffer, Fly Fishing in Saltwater Magazine, Core Angling, Paul Bruun Outdoor Columnist, Midcurrent LLC, Aardvark McLeod International Flyfishing Specialist, Bill Wichers, Hatch Outdoors, Ray Schmidt, TIDE, Green Reef Environmental Institute, Friends of Nature, Smithsonian Institute, World Wildlife Fund, University of Belize, University of Belize Student Government, Turneffe Atoll Trust, Turneffe Flats, El Pescador, The Radisson Hotel, The Lodge at Chaa Creek and Machaca Hill Resort.